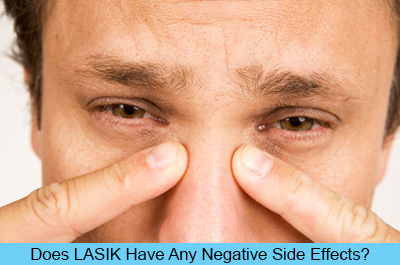 LASIK surgery has many benefits, but there are some negative side effects as well. If you are considering the procedure make sure you are aware not only of the positives, but also the potential negative side effects of the procedure. Some people choose not to undergo LASIK surgery because they feel the risks and potential negative side effects are too great while others believe the advantages of LASIK far outweigh the potential risks. LASIK eye surgery is permanent and the changes made to the shape of the eye cannot be reversed. Choosing to have LASIK surgery is a major decision and should not be made lightly. Once the surgery is complete, changes are permanent and cannot be undone even if negative effects occur. The first couple of days after a LASIK surgery procedure may be uncomfortable for some patients. Some people report feeling dryness and irritation. Other less common temporary side effects include: changing vision, glare, halos around images and difficulty driving at night. Most people notice improvement in both their vision and the negative side effects of LASIK within one to two days. Infection is possible after LASIK surgery, especially for those with a diminished ability to heal or with a compromised immune system. It is very important to carefully follow your doctor’s instructions in caring for the eye after LASIK to minimize the risk of infection. To best minimize the possibility of infection, your doctor will prescribe a prophylactic antibiotic eyedrop for you to use 3 days prior to surgery and 3 days post surgery. Many people expect that LASIK surgery will correct all of their vision problems resulting in perfect 20/20 vision without glasses or contacts, but this is not the case 100% of the time. For instance, some people may still need glasses while driving at night. Others may still need glasses or maybe even contacts after surgery, although their prescription may be less than before. Those that used reading glasses before LASIK may still need reading glasses after. Under or over treatment is a common reason for continued vision problems after surgery. This is one reason why choosing a skilled provider is so essential. Depending on your eye and the procedure you’ve received, additional correction may be possible. One of the most common reasons for dissatisfaction after LASIK is the need to still use glasses or contacts. It is important to realize that even with LASIK you may not achieve the perfect vision you are hoping for. While many vision problems after LASIK surgery are temporary, some people report long term problems with their vision including halos, blurry vision, glare and dry eyes. Some people report experiencing these side effects even six months after the surgery. Permanent vision problems can be a result of LASIK treatment. In rare cases LASIK surgery can lead to vision loss, sometimes permanent. Glasses, contacts or future surgeries may not be able to restore vision loss as a result of LASIK. LASIK surgery is permanent and if negative effects should occur, they may be permanent as well. That is why it is so important for the doctors to screen their LASIK patients very well before surgery. Not everyone is a candidate for LASIK. If you have thin corneas, have keratoconus or have any other corneal degenerative problems, you are not a candidate for surgery. One of the most common side effects of LASIK surgery is dry eyes. These are especially common in the first days or weeks after surgery, but in some cases can continue long term. Even if your eyes do not feel dry after the procedure, they probably are. Dry eye is not just uncomfortable; it can lead to other vision problems as well including blurring or loss of vision. In some cases dry eye can be treated with artificial tears. But more severe cases of dry eye may require prescription medication or more advanced treatments . While many precautions are taken to ensure LASIK surgeries are safe, surgical errors can still happen. This can be a result of many factors including human error or device malfunction. Though rare, these errors can lead to serious negative effects including vision loss and permanent damage to the eye. Make sure you choose a skilled LASIK provider with experience performing the type of surgery you are going to receive. While LASIK surgery is permanent, its results may diminish with time. You may be 20/20 after surgery, but may deteriorate to 20/25 or worse in a few years. These changes in vision occur due to normal fluctuations in your eye. Not because your LASIK procedure is no longer effective, but more because your vision changed. If your eyesight continues to deteriorate, additional procedures may be needed. Most surgeons offer a free touch up within a certain amount of time up to a few years. Other surgeons offer free lifetime touch ups. The long term results of LASIK surgery are unknown since the procedure has only been in use since 1998. Before undergoing LASIK surgery it is important to understand both the benefits and potential risks associated with the procedure. As with any medical treatment there is the potential for negative side effects and long term problems when undergoing LASIK surgery. Letter from patient Damaged by LASIK.